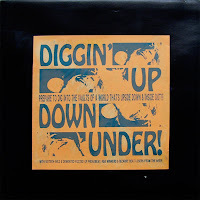 FuzzyWasabi: Diggin' Up Down Under Promo LP ! Just in time for Xmas, here's a rarity…One of the few Promo LP from Dig The Fuzz we ever found. You might know the Diggin' Up Down Under LP, chock-a-block full of Aussie and Kiwi Freakbeat nuggets. Well, this a rare occasion to see and hear the compiler at work. The tracklisting is very different as you'll discover when we will upload the official release. Hell, some of you might even find the promo better! "Dont' you fret" is probably the one that sticks out like a sore thumb, but the rest is quite the spazz. By popular demand, here's the back cover… nothing much to see there. Thanks! Really looking forward to tearing the wrapping paper off this one. Great post. deaf,dumb and blind boy(isss) from down under,says merry christmas to you, thanks for the many wonderful listening hours you have given to all of us,cheers!!!! Love the Last Straws. Thanks. Great music. Lot of different tracks from the CD. not possible to see back cover ?